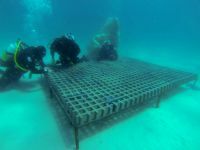 Innovative Institute for Marine and Antarctic Studies (IMAS) research has used kelp transplanted to artificial reefs to help explain why kelp ecosystems are being degraded around the world. Published in the journal PLOS ONE, the study found that adult kelp create favourable conditions for juvenile kelp by ‘engineering’ the environment to reduce water flow, sedimentation and light penetration. However, when kelp forests become patchy or less dense due to the effects of human-caused stressors they are less able to modify their immediate environment, negatively affecting juvenile kelp and leaving kelp forests vulnerable to further degradation.